A Boater's Guide to the Locks pamplet is available at the visitor center or administration building for pick up (sorry we do not mail them out). The website NWBoatinfo.com has some excellent detailed information that can be printed out. The Locks were built for and give priority to emergency and commercial vessels. Passage is free to all vessels. The large and small locks are open 24/7 everyday, except during annual maintenance. However on a busy summer weekend you might end up in the large lock with many vessels of all sizes, including large ocean tugs during low tide, so it is best to be well prepared. ...always carry a couple of 50 ft. lines aboard. The Large Lock Chambers can handle vessels and tows around 700 ft. long x 78 ft. wide. The Small Lock Chamber can handle vessels around 100 ft. long x 26 ft. wide. (See note below about individual situations). 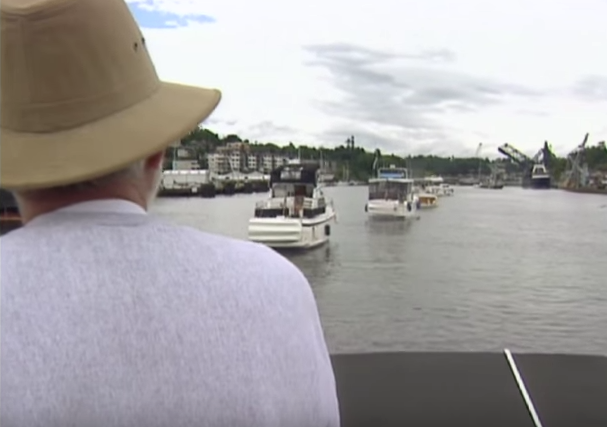 "Locking Through" for the first time or with an expensive boat can be very intimidating, especially at low tides. The Small Lock Chamber is easier as you just tie up to the side walls that float up or down.